This product is presently available for download as a free download. Also, it is not actively under development. However, people who already have a subscription can download the package from the downloads section. Any specific requirements? Contact us! It is available as a free download on github. Today no one can deny the role of the major Social networks like Facebook, Twitter and LinkedIn as Promotion and interaction media. If you are running a website, be it a small business website, a news portal or a Social network, you will know how the Slashdot Effect can help catapult your site to fame and fortune. 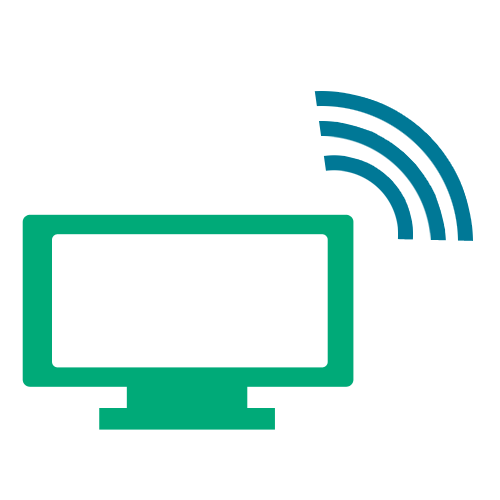 Broadcast is a Social Sync tool for your JomSocial, Easysocial and CB websites. If you use CB, you can use JomWall. 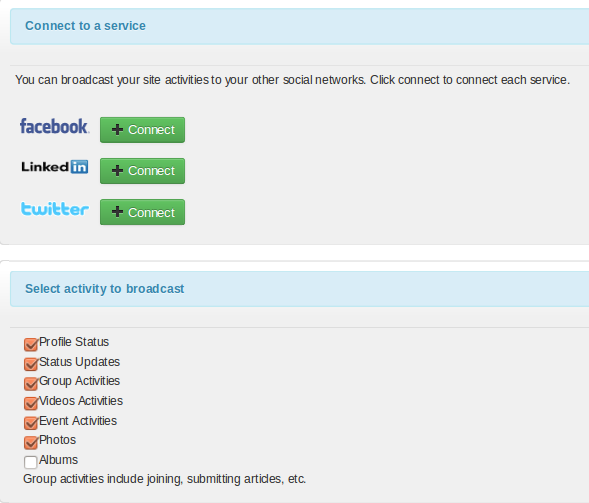 Push the activities and updates from your site to various supported Social Networks. 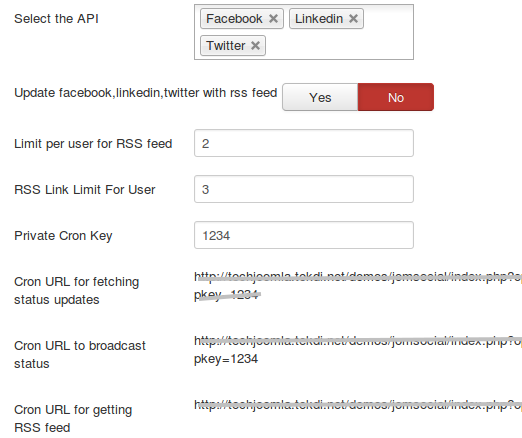 Pull activities and updates of supported Social Networks to your site. Users can use Broadcast to update all their Social Statuses from one place - your site!. Currently support Integration with Jomsocial, Jomwall and Easy Social. Also Broadcast can be used with Joomla by using different plugins. User level Configuration to connect and select content type. 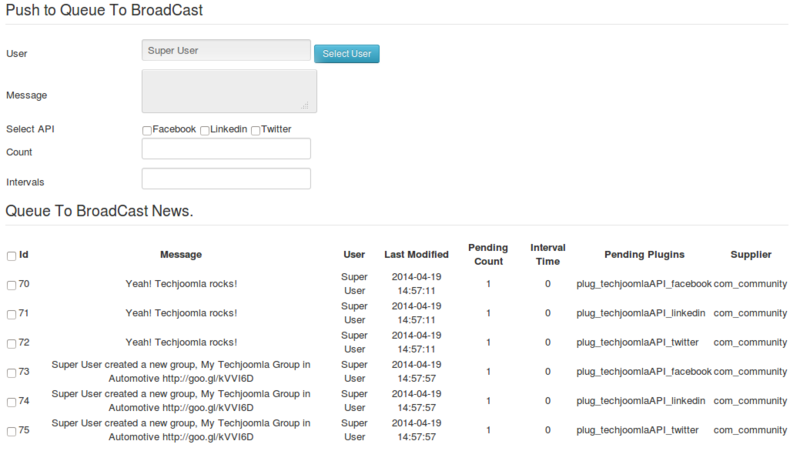 Each user can easily connect to respective social network and decide which social account to connect and define their activity types. For example, if the user selects images, text only images and texts are posted to Facebook, Twitter, Linkedin. Note that these activity types are different for Jomsocial, Jomwall and Easy Social. Also, each user can define their own rss urls from where updates come into the site. Support for Facebook Pages and Groups. For Facebook each user can select Facebook pages (which they have created) to broadcast. For Facebook each user can select Facebook groups (which they have created) to broadcast. Site Admin can choose which networks to offer. To get statuses from rss links. Also has some other configurations related to RSS. Manual Queue additions - Admins can manually push messages to the Queue. Also admin can choose user which is already connected to a social network and push activities for them. Also broadcast has provided API in a such a way that any Joomla extension push content to the broadcast Queue and from there we can push it in to a Social Network.